Trees add to our quality of life, and Tacoma Power encourages a healthy urban forest environment. However, when trees grow into power lines, they create hazards. Our tree crews work year-round to maintain required clearances on all transmission and distribution circuits we operate. Each circuit is inspected and trimmed on a four-year cycle. That provides the best program of control for growth and maintenance. If you are going to plant a tree under a power line along the street, please check out our list of recommended tree species. For questions about tree clearances from power lines, tree removal or related issues, please call Tacoma Power at (253) 502-8729. The exact amount of clearance needed in a given area depends on the voltage of the line and the type of line construction used. We must also consider line sag during temperature extremes as well as wind movement of power lines and trees. Tacoma Power will remove trees that are directly under or so close to our energized primary lines that they may pose an electrical hazard or are unlawful for a qualified contractor to remove. We will haul away branches and chips, but large pieces of wood may be left for the owner’s use. Trees that are severely leaning, dead, decayed or pose a hazard to power lines may be removed by Tacoma Power. However, we reserve the right to refuse removal of any tree that may be safely removed by a qualified tree worker when no electrical hazard exists or there is no possibility of damage to the electrical system. Homeowners who would like to make use of the wood chips from the trees we remove may call or email us. All chips are “as is” and delivered only in a full load. 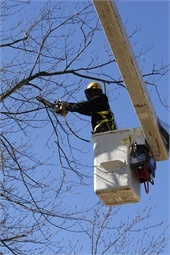 Trimming trees around services to residences and private lights is the customer’s responsibility. Tacoma Power will trim trees around service wires that run from pole to pole, including the first 10 feet of service wire from the power pole to the residence. In order to reduce the risk of electrical hazards, we will drop your service wire and reconnect it after your qualified contractor has completed their tree work. There is no charge for this service, but it may require up to five business days to inspect the area and schedule crews. Tacoma Power will trim trees and vegetation around energized power lines. It is important to keep alleys and rights of way clear of plants and debris so crews may safely perform maintenance or emergency functions on fiber optic cables, utility poles and padmount transformers. Trees next to distribution lines are trimmed so they will provide proper clearances, promote growth away from power lines and leave the customer with a well-trimmed tree. Unfortunately, some species are not suitable around power lines and continued trimming of these types of trees may not always look appealing.